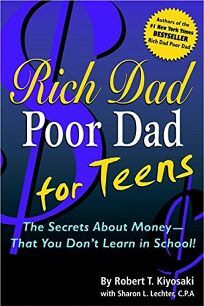 Teenage capitalists may want to cash in on Rich Dad, Poor Dad for Teens: The Secrets About Money That You Don't Learn in School! by Robert Kiyosaki, with Sharon Lechter. Pitching the ideas from his adult bestseller Rich Dad, Poor Dad to a younger crowd, Kiyosaki recounts his youth and explains the origins of the book's title by contrasting his own ""poor"" father with his best friend's entrepreneurial ""rich"" father. ""My dad seemed comfortable with his decision to be a have-not, ' but I knew that I wasn't."" Kiyosaki encourages teenagers to analyze their learning style, offers moneymaking ideas and describes debt-related pitfalls. (Aug.) .